It's almost my favorite time of the year! It starts in late September with my birthday and cartwheels into Christmas. What's not to love? Cooler weather, parties and celebrations, ma birthday...seriously, the best. I haven't done a wish list post in a long while, so in honor of the first day of September, I give you my fall/birthday list of lovely expensive things I normally wouldn't just run out and buy for myself. My mustard yellow pencil skirt from Target is great, but doesn't have as much structure as I would like and it's started to pill. This option from J. Crew is oh so pretty and would look super cute with heels or with a pair of riding boots. I've been wearing my Fossil gold bracelet watch almost daily, and it would be nice to add a different style watch into the mix. I love the vintage feel of this watch, and while pricey, it's still a lot less expensive than a Micheal Kors. I love my Kendra Scott tassel necklaces, and this necklace would be so pretty layered with them. I'd love one in every color: silver, gold and rose gold, but, realistically, if I have to choose just one I'd go with the rose gold since I don't have as many pieces in that color. The weather starts to get chilly in North Florida in late October. Not cold enough for a thick jacket, but something like this field jacket would be perfect. I did snag the factory version in olive (available only in stores cinched-waist version available online) but I just can't get over the gorgeous garnet color. We get a lot of rain in Florida, and what would be better to combat the wet than a pair of Hunter rain boots? I don't have a lot of experience with them, so for those of you who have them, do you prefer gloss or matte? I like the idea of gloss, but when I saw a video of them via Zappos they looked like they bunched kind of awkwardly. 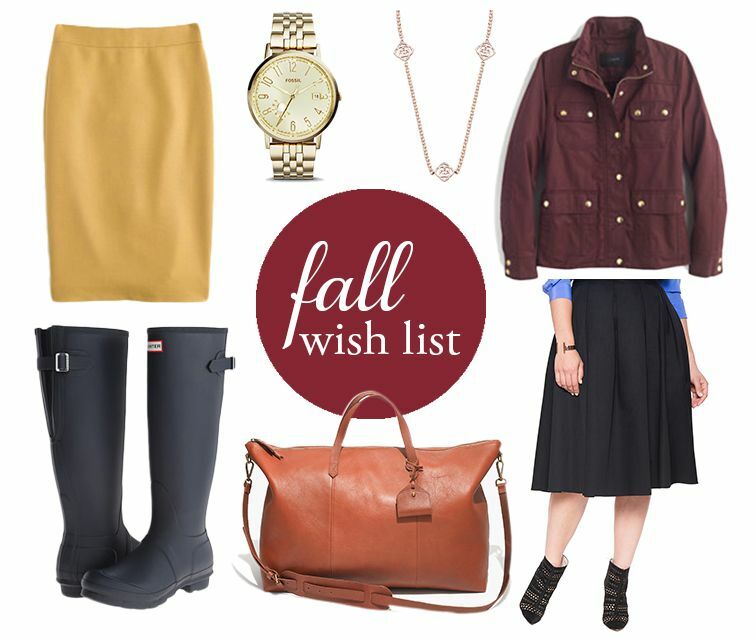 This bag would be the perfect for upcoming fall weekend adventures! Not convinced? Look at this Instagram pic from Fran. Soooo cute and classy! Since this big is pretty much out of my reach, this black and cream striped weekender from Lulu*s is a great alternative and costs about a sixth of the price. That pretty little bag may have to be mine in time for our trip to Gatlinburg. I have major fomo that I didn't snag Banana Republic's gorgeous black midi skirt last fall. This one from Eloquii (The Limited's plus-size line) looks similar and is so pretty and polished. I second all of these amazing picks. I swear by my double serge skirts. They're so comfortable.